Recently I embarked on a 45 day transformation challenge through my kickboxing gym, I Love Kickboxing Kirkland. 45 days to get into the gym and transform yourself from the inside out. Something everyone wants to do right? The motivation? $20,000 for the 1st place contestant. Now, the odds of me winning that, very slim considering there were over 3,000 others doing this challenge. I gave it my all though so I am hoping to win it all, or be an honorable mention (to which a few other prizes do exist). Anyway, point being, it was $10 to register and it would be six weeks of going to the kickboxing gym I was already going to. So why not? I had nothing to lose but weight right? But I had no clue just how much I had to lose. No, I’m not talking about pounds and inches (although yes I did lose some of that). I’m talking about the core of the purpose behind this challenge. The one that I knew was there but decided it didn’t apply to me. The one that they wanted to shine through to everyone but I thought it was too generic that it was just a marketing point to get more people to sign up. During these last 45 days I pushed myself to the limits that I didn’t know I could reach. From sticking to a strict schedule between being mom, wife, and a human being, to changing the way I eat and nourishing my body to make it able to stand this challenge (still improving on it, but I’m getting there). 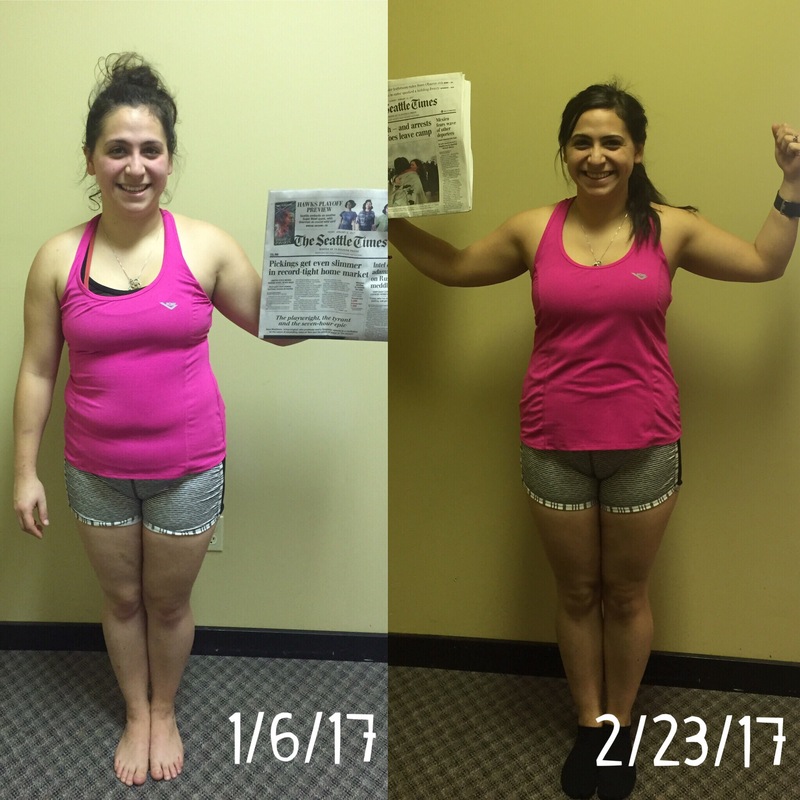 I have officially submitted my before and after photos. I hated taking the before. I hated looking at my body. I hated myself for thinking I could just find clothes to cover it all. Many times I felt insecure about myself people just never understood what I meant. They did their job in regards to helping me to love my body image no matter where I was at. But that’s where it ended. I accepted it and just continued to hide it all. This is where I began to master the art of deception. I began to deceive myself into believing I could be happy as long as I could cover up my imperfections. A nice coat. A beautiful scarf. Makeup. Hair. Attitude/Personality. As long as I could make you believe that I was happy with myself, then I won. My goal was to make you believe that I had some form of control and that what I was in control of was my happiness. As I mastered this area of my life, I began to let it seep into other areas of my life. It overcame my social life. It overcame my motherhood. It overcame my marriage. It overcame my ability to be a good sibling & daughter. That’s the biggest disservice I have ever done to myself. I hate that. I thought I had that on lock. I had the art of deception on lock. I had the ability to hold others accountable and by doing so that meant that I somehow was doing the same. The more I invested in myself in this way, the more I realized just how much my life was a big hot mess. From struggling in my ability to parent 2 children that are complete opposites, to struggling in my marriage as a wife, I isolated myself as much as I possibly could because the less I showed to others, the less I had to hold myself accountable. The less vulnerable I had to be. As I was getting my before pictures taken, I hated knowing I had to look at myself. Inch by inch. I had to let my fullness show when I least wanted to. I felt naked, and yet I was the only one who was going to see those photos for the next 6 weeks. But then time began to move along. Now here we are, 6 weeks later (well 6.5). I was standing up against the same wall I once stood at, getting ready to take my pictures again. 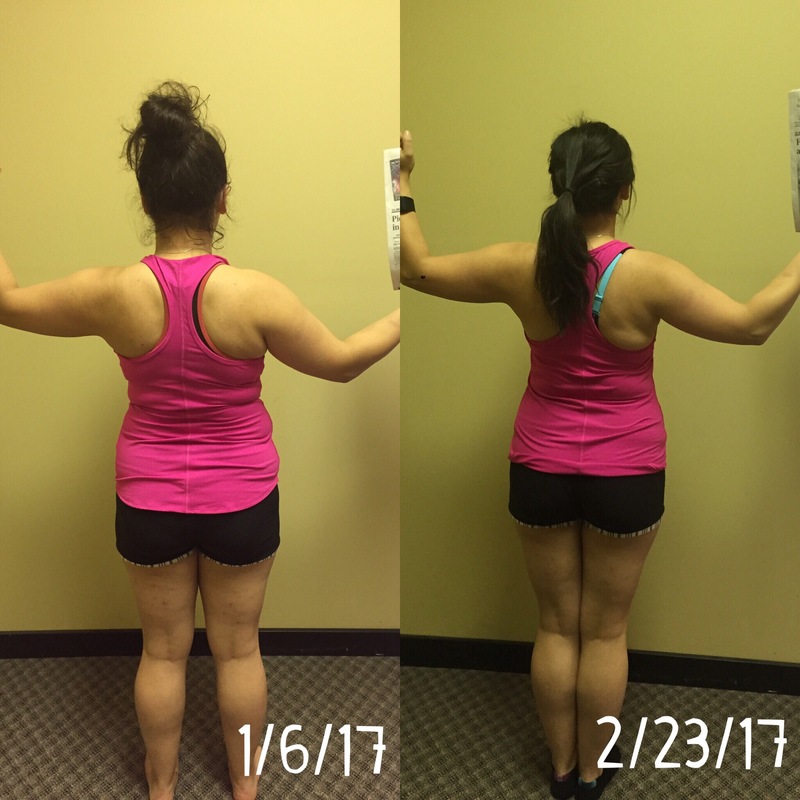 During these past 6 weeks the scale lied to me. It made me believe that nothing was changing. Yes small changes here and there, but nothing drastic. I believed that I was still the same person. I believed that I had more to hide. I began to realize that I lost the old me that didn’t like facing her fears, no matter how scary it seemed. I lost the old me that felt that the only way to feel beautiful was to accomplish a certain size. I believed that the only way to feel beautiful was to depend on someone else to make me feel that way. I lost the old me that thought she could do this on her own. I lost the old me that believed that deceiving herself was enough to get by. I lost the old me that believed she could be happy with settling. I lost it all. I am so glad to look at these photos and say goodbye to that girl. I’m so glad to know the truth that I am the only one who can hold myself accountable. Be it applied to my God, to my spouse, to my children, to my body, to my family, or to my friends. I am the only one who can make that decision to move forward in life in each of those areas. These past 45 days I grew in ways I never thought I could. I gained so much more than I lost on the scale. It was worth the $10 to hold myself accountable. It was worth being vulnerable in front of my instructors during each class as I began to sweat more and more each day. As I stood back to learn and ask questions. As I wanted to give up for a moment put the push straight through it again. My first instructor (who recently moved to open up a gym in a different state) was Jamie. She was the reason I was ever even introduced to kickboxing. As I sighed and cringed looking at my before pictures, wanting to immediately delete them, she told me not to. She told me that looking back at these would be so worth it all. That there would be a difference and that it was going to be noticeable. She knew that I needed to SEE it for myself. To compare it. Everyday as I looked in the mirror I saw no difference. I felt different slowly overtime, sure, but I saw no real difference. I still looked at myself and judged myself so harshly. I wish I could compare myself side by side in regards to how I treated myself. How I let others treat me. 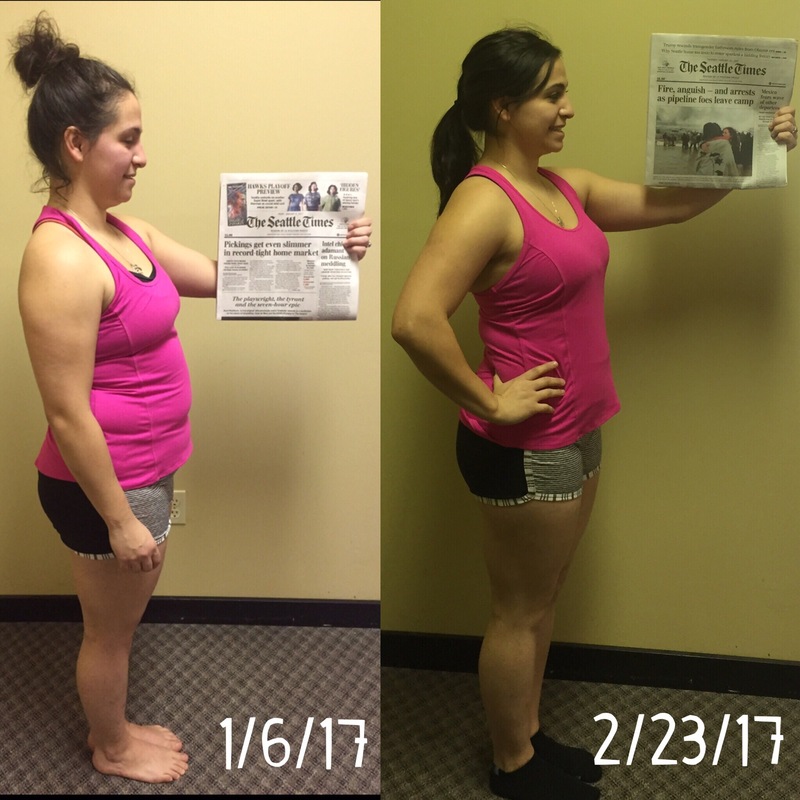 I know I haven’t reached my personal goal yet, but knowing I’m getting closer has helped me to open my eyes to so much more. It’s opened up my eyes to the hope that lies deep in my heart of what I want in life for myself. I realized that taking care of myself wasn’t a bad thing. Something I always set aside. Sometimes I still do, but in moderation, it’s survivable. I’m not too sure what the point of this was anymore, truth be told. All I know is that I learned so much these past 45 days that not talking about it would be a disservice to myself and to others who are struggling in the area of their life. That’s it. Hold yourself accountable that way. Want a cash prize? If cutting out a certain food or drink that was a usual for you is going to be part of what it takes to make some changes, cash yourself some money in a jar in that amount and make that your prize money. Every time you get tempted, just grab the cash and put it away instead. That’s what I will be doing to continue on with my journey. Take that before and after photo and take a moment to describe yourself and what you think about yourself on day 1. On day 45, describe yourself again. You can do this. Stop believing you can’t, because you 100% can. Don’t be a master of deception. Be a master of self personal accountability.